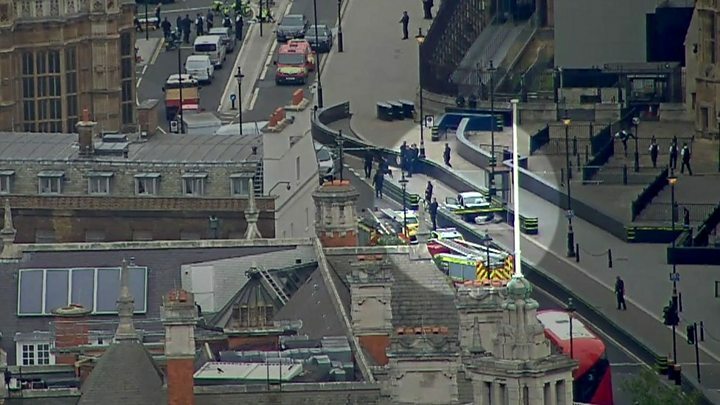 Police are searching three addresses in the Midlands after a man was arrested on suspicion of terrorism following a car crash outside Parliament. The 29-year-old British suspect is not believed to be known to MI5 or counter-terrorism police. A vehicle swerved into cyclists and pedestrians shortly after 07:30 BST before crashing into a barrier outside the Houses of Parliament. Two people were treated in hospital for their injuries but later discharged. A third person with minor injuries was assessed at the scene. No-one else was in the car when it crashed and no weapons were found in it. Searches are taking place at two addresses in Birmingham and a residential property in Nottingham. The suspect, who has not been formally identified, is being held at a south London police station but police said he was not co-operating with officers. Security minister Ben Wallace said he was British but originally from another country. Labour’s Roger Godsiff, MP for Birmingham Hall Green, tweeted that the driver was “believed to have been living in my constituency”. Police say the vehicle was driven from Birmingham to London on Monday night, was in the Tottenham Court Road area until about 06:00 and was seen driving around Westminster and Whitehall for 90 minutes before the incident. A number of eyewitnesses have said the silver Ford Fiesta, which was travelling westbound in Parliament Square, appeared to deliberately hit members of the public as it swerved into the opposite lane. Footage released by the BBC shows the moment when the car then crosses over a traffic island in the middle of the road before crashing into the security barriers. A police officer can be seen jumping over another barrier to get out of the way. Westminster Tube station was closed and streets around Millbank and Parliament Square cordoned off for several hours. The immediate area around the incident remains taped off and screened by white temporary fencing. Parliament is not currently sitting. British Transport Police said it was increasing patrols in England, Scotland and Wales and that its officers would be “highly visible on trains and at stations”. The prime minister has paid tribute to the “formidable courage” and professionalism of the emergency services who “ran towards a dangerous situation in order to protect the public”. The Houses of Parliament are surrounded with security barriers of steel and concrete. 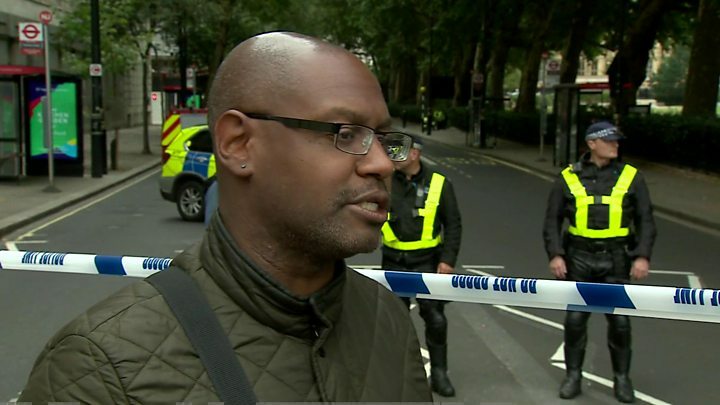 The measures were extended in the wake of the Westminster Bridge attack in March 2017 when Khalid Masood ploughed a car into crowds on Westminster Bridge, killing four people. Security arrangements at Parliament have progressively tightened since 2001. In the aftermath of the 7/7 attacks, new truck bomb-proof barriers were installed in an effort to “target harden” Westminster. These include the reinforced low black rampart-like walls that surround Parliament itself and a highly visible armed police presence. Visitors need to go through a chicane-like system designed to help armed officers spot suspects. The one significant weak spot was the main vehicle gates – as became apparent in March 2017’s one-man attack. 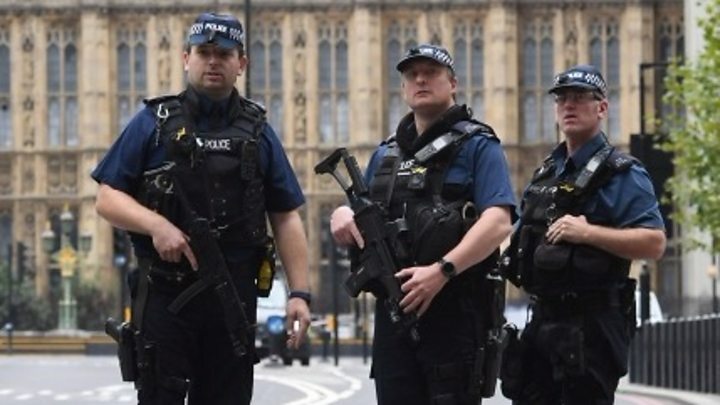 That triggered an internal security review that has led to changes that remain secret – although it’s apparent to Londoners that there are now more armed police than ever before patrolling the area. The threat of terrorism is a constant concern for Parliamentarians – it’s not new. The IRA murdered Airey Neave MP in 1979 in a car bomb that exploded within the palace grounds. And the dilemma remains the same: how best to balance security with guaranteeing that the heart of British democracy remains open to the people. The prime minister’s official spokesman said as of the end June 2018 there were 676 live investigations into potential terrorist plots. He said since March 2017, 13 Islamist plots and four far-right plots had been foiled. Scotland Yard is asking anyone with information on Tuesday’s crash to call 0800 789 321. Anyone with video or pictures of the crash is asked to send them to police.